Picked up a few minor gems last night. Zelazney is the only author on the Appendix-N list, though I'm not sure if htese particular books are or not. Jeff T recommended Wagner for pastiche Conan and I noticed that book 'Skraelings' was a New Infinities product out of Lake Geneva, WI. They had a couple of fantasy novels by Jim Ward but, as much as I respect that guy, they didn't speak to me. If anyone has read any of his fantasy novels and liked them, I'm open to giving them a shot. 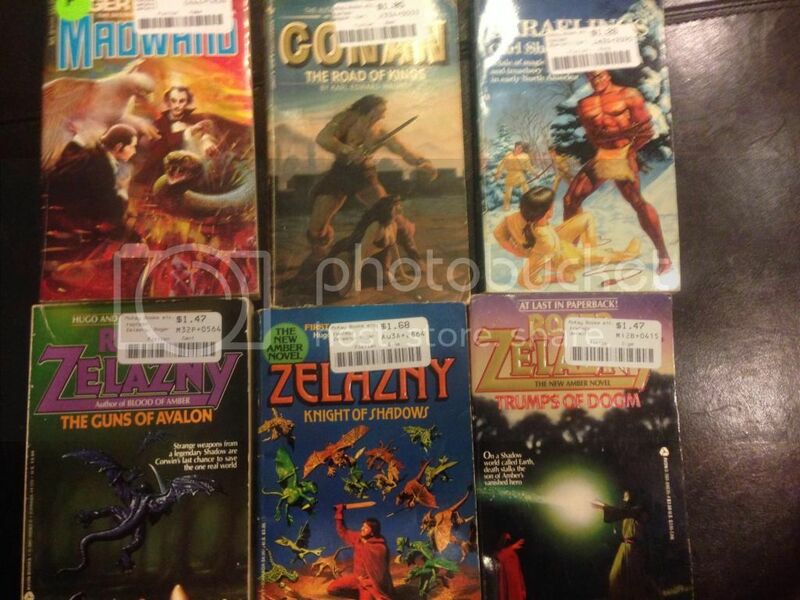 Those Zelazny books are part of the Amber series and def. part of the Appendix N store. That series is probably Zelazny's best work--at least his coolest. Awesome, thanks for the heads up. Druvas did good. You did very good with the Conan. It is the only Non-Howard Conan that does him justice. Karl Wagner was a fantastic writer. Madwand I believe is the sequel to Changling. Guns of Avalon is book two of the first Amber series. Trumps of Doom I think is book one of the second series. Have to check out "Skraelings" its my favorite word anymore. Probably vikings versus indians. Nice haul. Thanks, Jason. Wasn't New Infinities affiliated with Gary or TSR somehow? New Infinities was Gygax (and the old TSR guard that followed him into exile). The rest of Gygax's Gord the Rogue novels were all printed by New Infinites as well as some other titles. I hadn't heard of Skraelings before. Just ordered The Savage Tales of Solomon Kane. It is my understanding that it is a comprehensive, unedited version of his Kane material. Anyone know anything to the contrary? Thanks! It is absolutely the unquestionable finest presentation of the stories, with fascinating end notes by the editors. You've made a great choice! Looks like you have some great, local used book stores! There's a great place nearby that is damn near 50,000 sqf of floor space, all of it used books, music and movies. My old childhood haunt for comic books is also something of a rare old book shop as well. It's called Hole in the Wall and it literally is just that. It's an old house, probably 70 years old or so and has been in business at least 35-40 years. Sadly, they know the value of some older books and the prices aren't as good as the huge store nearer to me, but I still think I got a good deal. :-) I capped the day yesterday, after finding these books, with a up close and personal concert with Queensryche (might start a thread for that due to the epic awesomeness that it was)! Nice haul! Those Skaith books are fun. Nothiing mind-shattering, but a good yarn. 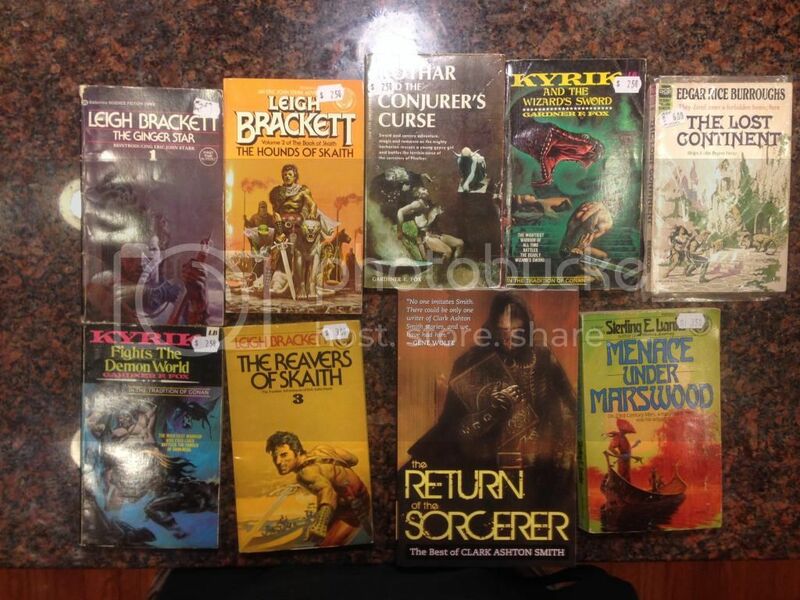 And, of course, Leigh Brackett was partly responsible for The Empire Strikes Back, so you know there's quality there! I need to check out Lanier. For some reason, that's a hole in my reading. Ah, well, only a few more months till I get out where used bookstores can afford to exist. They have been steadily disappearing in NYC. Nice heist! The only one I don't kniw is menace under marswood but I would have grabbed it in a second. Agreed. I've got some of the paperback versions of Solomon Kane but I never read them. The "Savage Tales of Solomon Kane" is the best collection I have of those stories. Solomon Kane is really a "dark paladin" if there ever was one. Conan is a great hero and most famous of Robert E Howard's characters, but my other two favorite Howard heroes are Solomon Kane and Francis Xavier Gordon and neither should be overlooked. You might also look for "El Borak and other Desert Adventures", which is in the same series as "Savage Tales of SK" and features Francis X Gordon. I finally finished the Kane stuff and was pleased with it. It was hard going at first. I think I was taken aback by the description of some blacks, but I put it in context and rolled with it. Upon further reflection, I'm not sure that he was being overtly racist so much as 'evolutionist' (does that make sense?). I know what you mean. I first started reading Howard, Burroughs, E. E. "Doc" Smith, Lovecraft, etc. about fifth and sixth grade (1967-1969) and from there started gobbling up anthing "fantasy" and "science fiction" and have yet to stop. I still love that old stuff even though what I mostly read now is the modern stuff. I'm afraid that too many modern readers might feel that they are too "sophisticated" to read the old pulpy classics. Beyond that, I'm not sure that love for these old classics will be passed on down to the next generation, particularly because of the way non-white races were referred to and portrayed. I can enjoy the old stuff because I can read them and accept them for what they were and not judge them by the standards of the world 80 years in their future. But then again, I was only about 30 - 45 years removed from their creation when I first read them so I cannot relate to what a new reader removed 80 years from their creation might think of them upon a first reading. Are any of you aware that when Edgar Rice Burroughs, Inc. prepared the Tarzan series for paperback release in the early 1960 that they "cleaned up" the text and removed a LOT of offensive racial portrayals and dialog. That version of the texts have been standard now for about 55 years and even most devoted Burroughs fans don't know that what they're reading isn't the fully original texts. If you read some of the original pre-World War I text and are unprepared for it, you'll be shocked. But if you know the world as it was back then, you'll see that Burroughs isn't any worse than anyone else and, in fact, actually portrays some non-white characters with nobility and sympathy. But all of this can be a huge hurdle for a new reader of today.